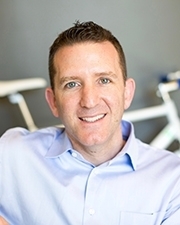 Doug Ulman joined Pelotonia in November 2014 as president & chief executive officer. In this role, he is responsible for overseeing the strategic vision and direction of Pelotonia and also serves as an advisor to The Ohio State University Comprehensive Cancer Center – Arthur G. James Cancer Hospital and Solove Research Institute. Doug is a three-time cancer survivor and globally recognized cancer advocate. After overcoming chondrosarcoma during his sophomore year of college and malignant melanoma twice since, Doug and his family founded the Ulman Cancer Fund for Young Adults, a nonprofit organization dedicated to supporting, educating and connecting young adults, their families and friends who are affected by cancer. With funding from an Echoing Green Fellowship, Doug served as Executive director of the organization for four years before joining the LIVESTRONG Foundation in 2001 as director of survivorship. He went on to lead LIVESTRONG as president and chief executive officer, establishing the organization as the global leader in cancer survivorship. Doug speaks frequently at some of the nation’s most acclaimed festivals and conferences including the Social Good Summit, the Inc. 500|5000 Conference, the Aspen Ideas Festival, the Clinton Global Initiative University, TedxAustin, SXSW Interactive and at YPO chapters across the country. Doug has also spoken to, and consulted with, numerous Fortune 100 companies and fast growing startups. Doug’s personal story and his leadership accomplishments have been featured in major media outlets including the New York Times, the Wall Street Journal, USA Today, Sports Illustrated, NBC News, ABC News, MSNBC and many others. Doug has been honored with many accolades including twice being named on the Non-Profit Times Power and Influence Top 50 Non-Profit Executives list bestowed on the top non-profit leaders in the United States. Doug currently holds numerous civic and charitable board positions for organizations such as the Ulman Cancer Fund for Young Adults, the Campaign for Tobacco-Free Kids and C-Change. He is an active member of YPO Doug served for four years on the National Cancer Institute Director’s Consumer Liaison Group and has served on the board of the Union for International Cancer Control as well as many other philanthropic, healthcare, and entrepreneurial ventures. Doug lives in Columbus, Ohio with his wife Amy Grace and their two children Clara and Sam. Follow him on Twitter @dougulman.